Here companies and industries that plan to manufacture wind turbines will find information of our products and experiences. In the design and development field of wind turbines I offer to share my knowledge and experiences with you - gained during 30 years of professional work for the industry. I designed my first commercial wind turbine in 1977; a 22 kW machine for the Dansk Smedemesterforening, now DS Trade and Industry, an organisation that delivers organisational and technological services to 2000 SME’s (small and medium-size enterprises). Using components from specialised sub-suppliers, it pioneered very successful Danish concepts within wind power. Glass fibre blades from industrial manufacturers, asynchronous generator and grid connection soon became the preferred solution used by manufacturers like Vestas, Nordtank and others when they entered the wind energy scene around 1980. Later designs from my desk for the DS were of 95 kW and bigger. 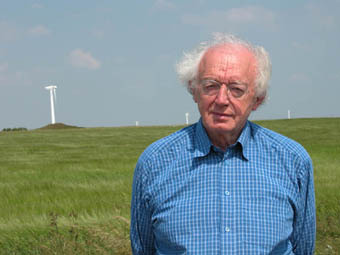 In 1980 the newly formed Danregn Vindkraft invited me to advise and support the development of the very first Bonus wind turbines of 30 and 55 kW. The successful design principles of the preceding types were applied to Bonus wind turbines that were launched professionally, and soon became exported in large quantities. They were famous for their efficiency and reliability. The early 1980’s was a seller’s market for wind turbines. Responsible for design and development, I headed a very productive engineering team at Folkecenter. We designed complete 150 and 275 kW wind turbines for Vindsyssel; 100 kW for Baltic Power; 75 and 200 kW very elegant machines for Dencon; 150 kW for Reymo, Moen and Codan, all new manufacturing companies. Also with WindWorld and Nordex, newcomers to the family of manufacturers, you find examples of my design principles and several details. The 525 kW wind turbine that got support from EU, became the culmination of this design process. Two prototypes were built in cooperation with German Tacke, later Enron and today GE Wind, that has its roots in one of my designs. The 525 kW prototype in Hanstholm has operated without any repair since 1992 and delivers year after year 1,5million kWh from its near-shore location facing the rough winds of the North Sea. There is no better evidence of quality and reliability! Two years later three similar wind turbines were added, using the same convincing efficiency and simplicity that we continue to scale-up. In the 1990’s our wind energy focus changed. The Danish authorities wanted to take advantage of our design and implementation expertise and invited me to take leadership in a number of East European prototype projects. For a decade I was responsible for demonstration projects with local manufacturing of 75 kW wind turbines in Poland, a 600 kW demonstration project in Kaliningrad, 2 x 250 kW project in Siberia in cooperation with Elsamproject, plus several other renewable energy projects in Hungary, Germany, Romania, Ukraine, Russia, Japan, Brazil, Cuba, Mauritania and Mali - which gave us unprecedented experiences and contacts worldwide. To meet the contemporary requirements and technical standards, I decided in 2005 through XMIRE to form a wind turbine consortium. Its key partners consist of highly competent and specialised engineering companies and institutes, including the Folkecenter, as well as independent consultants. As a concerted effort we are now able to offer MW-size A to Z design and support to new manufacturers.